For today’s post, I am walking through an Emotet malspam that we received this past Friday that contained a simple link that lead to a macro enabled Word document. Googling around I see that @dvk01uk came across the same URLs 5 days ago. You can read that post here. Running the maldoc in my test VM showed that the initial link was still working and downloaded an executable. When running that executable on my test VM, I saw a couple of POST requests going to dead sites. First I will walk through the script that I deobfuscated and then the traffic coming from the maldoc. For more information about Emotet, see this article from SC Magazine. The sample that I discuss here does not seem to be using any worm like propagation techniques as described from the team at Fidelis. For all the PCAPs and artifacts from this investigation, please see my repo located here. So there are a couple of ways to go about getting access to the deobfuscated script. You can use tools like Olevba.py from Decalage or oledump-py from Didier Stevens, or my favorite OfficeMalScanner. This walk through will focus on the use of OfficeMalScanner. Using OfficeMalScanner and the “info” option as seen in the image below, it pulled out two files that contained the malicious script (both are the same by the way). The following is the original script. dZmAMvagz = SekyzxBsr + ActiveDocument.BuiltInDocumentProperties("Comments") + ""
One of the things that I have learned while trying (emphasis on trying) to deobfuscate scripts and learning this art is that one should just glance through the script to see if anything stands out (keywords, URLs, paths, etc…). With this script, the first thing that stood out was the sub autoopen procedure, and then the middle section since it contained things like “ActiveDocument.CustomDocumentProperties” and “ActiveDocument.BuiltInDocumentProperties(“Comments”).” Doing a quick double click in Sublime Text with some of the other function names showed that nothing was calling them and was added to script to confuse the analyst. Below is the cleaned up script. Interestingly enough, if you open the Word document and go back to the properties of the file, the “Custom” tab and the data within “Comments” field are gone. If you close out the Word doc, they come back. So the script above is using these bits embedded into the Word file itself for something. We will get to that in a moment. 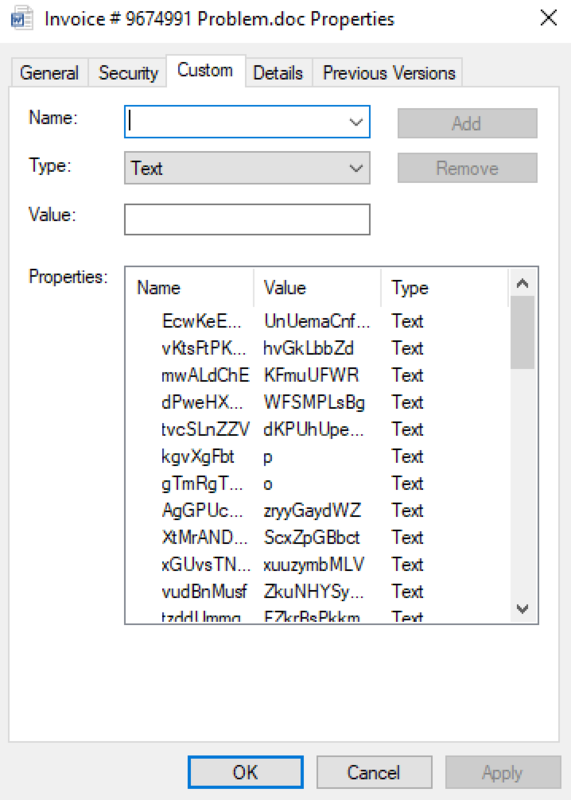 So when looking at this macro, like any macro enabled Word document, I started off looking at the sub procedure called autoopen which calls the function ‘GnLpEPBGuvx’. This function creates an object as seen via ‘CreateObject’ while also calling the ‘uMvWKNsFzRd’, ‘ugCunPaK’, and ‘dZmAMvagz’ functions. The code then calls the “ugCunPaK” function and passes “FEdDZxrN,” “eZumagfGLaB,” and “tAxtxcsvzy” as parameters. 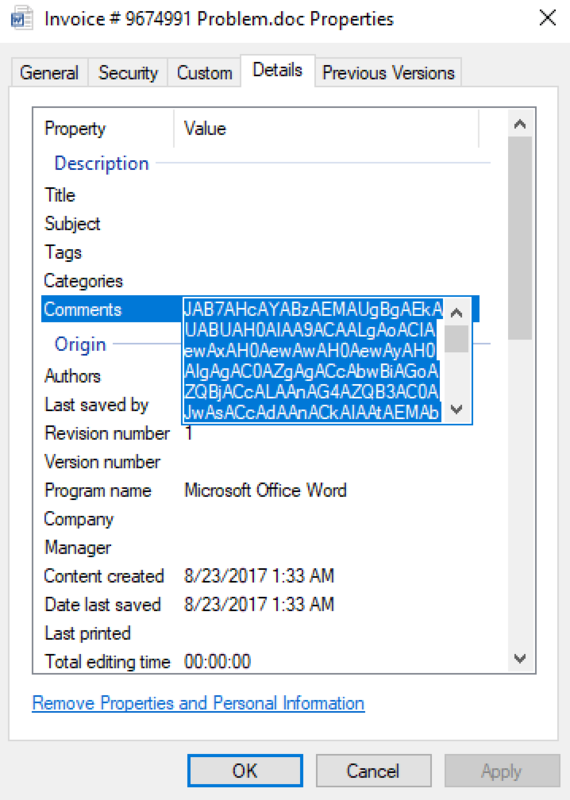 When the “ugCunPaK” function is called, it looks up the values “FEdDZxrN,” “eZumagfGLaB,” and “tAxtxcsvzy” in the comments of the Word file which translates to ‘Wscript.’. It then passes back to the GnLpEPBGuvx function and proceeds to do the same thing again just using “hafbyEHH,” and “gsbuMzRpUVs” as the parameters that get passed. Note: I didn’t know about the above method until I read @dvk01uk’s post. Thanks for the tip dvk01uk! MZ......................@............................................. .!..L. !This program cannot be run in DOS mode. From the host perspective, this is pretty straight forward. The file “GVhZFRnuDfWvPO.exe” executes itself, and spawns another copy of itself in the same location. This instance of “GVhZFRnuDfWvPO.exe” then proceeds to perform a SetRenameInformationFile operation and creates the file “serviceprov.exe” which is the same file as “GVhZFRnuDfWvPO.exe” but now in a new location – C:\Users\%username%\AppData\Local\Microsoft\Windows. This initial instance proceeds to spawn another copy of itself and is the process that is responsible for the POST commands seen above in the PCAP.